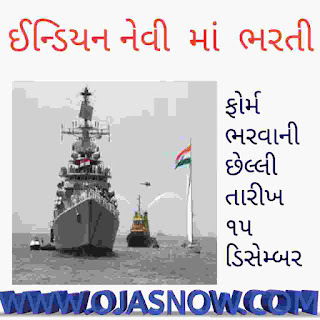 The Indian Navy is the naval branch of the armed forces of India. The Indian Navy can trace its lineage back to the 17th-century East India Company's Marine; it succeeded the Royal Indian Navy, which was renamed in 1950 after India became a republic. The 17th-century Maratha emperor Chhatrapati Shivaji Bhosle is considered as the 'Father of the Indian Navy'. The Indian Navy is a well balanced and cohesive three-dimensional force, capable of operating above, on and under the surface of the oceans efficiently safeguarding our national interests. Indian Navy comes up with latest recruitment details on a various post based on Education / Qualification for the interview process all over India. ndian Navy Recruitment 2017 Job alert both Fresher and Experienced can get Indian Navy recruitment 2017 updated on November 5, 2017, notification of recent Indian Navy recruitment 2017 openings across India. This is an exclusive page updated on 05.11.2017 for the latest recruitment notification from Indian Navy 2017 it contains both active and recently expired Job openings and recruitment notification from Indian Navy 2017. The government of India, Ministry of Defence recruitment of Civilian Personnel in Indian Navy-2017. The Indian Navy invites applications for the post of Fireman (Erstwhile Fireman Gr.II and Gr. I) from persons serving in similar, equivalent or higher grades in the lower formations of the Defence Services at Naval Dockyard, Mumbai and Outlying Units. Apply within 42 days from the date of publication of advertisement in Employment News Paper 04 - 10 November 2017 Issue. Essential Qualification: Matriculation or equivalent from a recognized Board/ Institution. Height without shoes- 165 cms. Provided that a concession of 2.5 cms heights shall be allowed for members of the Scheduled Tribes. Chest (Un-expanded) - 81.5 cms. Chest (on-expansion) - 85 cms. Weight - 50 Kgs. (Minimum). Indian Navy Selection Process: Physical Fitness Test, Provisional Appointment Letter, Document Verification. The last date of receipt of application through proper channel i.e. through Head of Office/ Establishment is 42 days from date of publication of advertisement in Employment News (i.e. Last date may be 15/12/2017) and the last date for receipt of Application from the candidates residing in Assam, Meghalaya, Arunachal Pradesh, Mizoram, Manipur, Nagaland, Tripura, Sikkim, Ladakh Division of Jammu and Kashmir State, Lahaul and Spiti District and Pangi sub-division of Chamba District of Himachal Pradesh, Andaman & Nicobar Island and Lakshadweep will be 49 days from the date of publication of advertisement in Employment News.